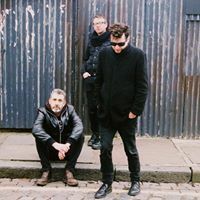 Bursting onto the scene, THE LIFE AND DEATH have injected a new energy into the London UK alt-rock underground, thrilling crowds with their emotional, dynamic live shows. Following a packed show at one of London's best-loved underground venues – the Sebright Arms in Bethnal Green, east London – 2016 kickstarted with the release of a head-turning single – Hey Sister – and a stunning appearance at London's Lexington venue and concluded with a jaw-dropping performance at the beautiful and iconic George Tavern venue in London's East End. Now THE LIFE AND DEATH step forward in 2017 with the release of their brand new EP – THIS HEART HAS BEEN BROKEN – songs of love, heartbreak, longing and sorrow in our troubled times. Music for the lost, the hopeful and the brave of heart; come join with THE LIFE AND DEATH and let's go places.